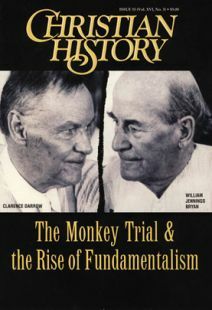 Fundamentalists have long endured criticism not only from liberals but from evangelicals and secularists as well. Christian History interviewed a fundamentalist historian to get his take on the “rap” against them:Mark Sidwell is production coordinator of Bob Jones University Press, a leading publisher of textbooks for Christian schools. He holds a Ph. D. in church history from Bob Jones University, a fundamentalist school. He is co-author of a high school U. S. history text and author of Free Indeed: Heroes of Black Christian History (Bob Jones, 1995). Regarding 1920s fundamentalism, one evangelical historian told us: “Too many mistakes, too much controversy, too many bad things done to save good causes.” Do you agree? As an overall evaluation, I obviously don’t agree. Fundamentalists made mistakes; I certainly don’t think it was good that J. Frank Norris shot someone in his office! Some fundamentalists would have done things differently had they had better insight or knowledge. But we must remember they were confronting a belief—modernism—that was absolutely contradictory to historic Christianity. It’s hard to be polite and restrained when you’re dealing with deadly error. Many in our culture assume history has vindicated liberals. I think the opposite is true. Just look at the decline in numbers and influence of the mainline denominations. There are a lot of other cultural factors involved in that decline, of course, but I think theological liberalism is one. Furthermore, liberalism has continued to decline theologically. Liberalism in 1920 was more conservative than today’s liberalism. Homosexual ordination would not have been tolerated then, not as it is today in liberal circles. Time has revealed the consequences of liberalism’s decision to turn its back on the authority of the Word of God. Finally, there is the fact that fundamentalism has survived and flourished, in spite of hostility of liberals and the media. Fundamentalists were addressing real needs that liberals could not meet. Fundamentalists are often considered angry and judgmental. Is that completely inaccurate? Like most caricatures, it’s based on something in history. Some fundamentalists have been too angry. But sometimes we’re angry because of the natural frustration humans feel when confronted with wrongdoing. When people are so willing to contravene the laws of God, a natural anger will result. We fundamentalists have to make sure that the anger we feel is a righteous anger against evil; we should not allow ourselves to get carried away. Don’t fundamentalists tend to equate political conservativism with biblical Christianity? That’s a danger for us, certainly. But we’re more suspicious of conservative politics than many realize. For example, we've gotten some flak from conservative business interests here in Greenville County because of stands we've taken. Last year our county council passed an ordinance condemning homosexuality as inconsistent with community life in Greenville County. It caused a big uproar, and the Chamber of Commerce came out against the ordinance because it felt such a pronouncement would be bad for business. So fundamentalists in this case split from the usual conservative coalition, which includes business. It was a moral issue to us, not only in that we wanted to speak out against illicit sexuality but also against greed and profit-at-any-price. Don’t fundamentalists tend to split over theological and moral minutiae? Sometimes this happens. It’s a danger. But you have to decide what’s scriptural and what is important enough to be a point of division. And that’s tough; it takes a lot of care and prayerful study. And, of course, people will make mistakes in deciding. And I might point out that fundamentalism started as an effort by Christians to ignore minor differences in order to unite in defense of the essentials. I know we at Bob Jones University (BJU) have often been accused of being hyper-separatist, but people don’t see what has gone on behind the scenes. Take Jerry Falwell and the Moral Majority in the 1970s. When he started in politics, he began working with Catholics and Mormons, among others. These were certainly not fundamentalists; some were not even Christian. Yet he was drawing them together in almost a religious crusade. Still there was a genuine attempt to talk things over with him. I was an undergraduate at bju at the time, and I remember Dr. Jones, Jr., speaking in chapel, saying he’d just met with Jerry Falwell, and he felt they had settled a lot of the problems. In spite of all our efforts, however, eventually Falwell went his separate way. In his case, I think it’s clear that Falwell split from fundamentalism. He’s shown that he’s been willing to work with charismatics (in the ptl scandal), and he’s even made some accommodation to Roman Catholics. In Sports Illustrated, he referred to Lou Holtz, then coach of Notre Dame, as an evangelical Christian. The very fact that he invited Billy Graham to speak at this year’s Liberty University commencement shows how far he’s removed himself from us. Many say fundamentalists should emphasize love, not purity, as the mark of the Christian. Certainly Scripture teaches the importance of unity among brethren. It teaches love. It teaches compassion. And fundamentalists need to manifest those qualities just as much as other Christians. Our problem is when people violate basic matters of Scripture and then tell us we have to be understanding or inclusive about it! To us this is simply mixing light with darkness. Second John (not to mention teachings of Paul and Jesus) tells us that if someone comes to you and doesn’t bring the doctrine of Christ, don’t have anything to do with him. Don’t have him into your house. Don’t bid him Godspeed. Still, separation has to be done in love. We don’t get any joy out of separating from others. But we must obey the Word of God. If this involves breaking some sort of friendship or tie, we’re sad about that, but we show our love for Christ by obeying all his commandments. In evangelical and liberal circles, love often seems to be defined as a sort of sentimental inclusivism. But as any parent knows, sometimes love involves making difficult choices and taking a stand. Mark Sidwell is production coordinator of Bob Jones University Press, a leading publisher of textbooks for Christian schools. He holds a Ph. D. in church history from Bob Jones University, a fundamentalist school. He is co-author of a high school U. S. history text and author of Free Indeed: Heroes of Black Christian History (Bob Jones, 1995). Evangelism in the Early Church: Did You Know? Little known or remarkable facts about church growth in the ancient pagan world. Early Christians used a hodge-podge of methods to draw their neighbors’attention to Christ.